Scrap and Stamp with Ronnie: Scrapbook Saturday on a Monday! Scrapbook Saturday on a Monday! I am sorry I am late this week with my layout to share. My weekend just turned into one of "those" weekends! Today I am sharing with you a layout using the new Lullaby range of papers. I think these are supposed to be baby themed papers, but they are no pictures of babies or anything baby related on them making them versatile for any occasion! 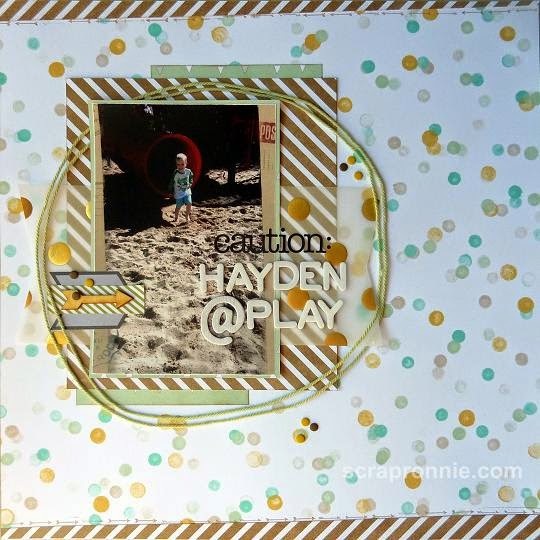 Materials: Lullaby DSP (133695), Fancy Foil Designer Vellum Gold (133363), Thick Bakers Twine Pistachio Pudding (135635), Everyday Adventure PL Accessory Pack, Make Note Rotary Stamp (133370), Brights Candy Dots (130931), Neutrals Candy Dots (130934), Baked Brown Sugar ink (131174), Random letter from my stash.